The Central Powers had seen significant successes in 1915. Although Italy entered the war allied with Britain and France, Austria-Hungary held the Italian army on the line of the Isonzo River just inside its border with Italy. Germany and Austria-Hungary had defeated Russia in the Battle of Gorlice-Tarnow, driving its armies back as much as 300 miles. With their new ally Bulgaria, the Powers had overrun Serbia, significantly reduced Russia’s communication with Western Europe, and delivered troops and supplies to Constantinople. Turkey had stymied the Anglo-French invasion at Gallipoli which the Allies completed evacuating on January 8, 1916. The attempt of Anglo-French forces, some transported from Gallipoli, to aid Serbia by invading neutral Greece had been stopped by Bulgarian forces. As 1916 began, a British army of 25,000, many of them Indian troops, was besieged by Turkish forces in Kut-el-‘Amara in Mesopotamia. In late 1915, military commanders of France, Great Britain, Russia, Italy, and Serbia agreed to major and simultaneous Allied offensives on the Western, Eastern, and Italian fronts in the coming year, without agreeing a timetable, something Joseph Joffre and Douglas Haig, the French and recently appointed British commanders, settled weeks later on a plan for a joint Franco-British offensive at the Somme River where the French and British forces met. In January, the Western Front stretched 466 miles from the English Channel to Switzerland. Six Belgian divisions held the sliver of unoccupied Belgium with French units on their left, holding the Channel coast. To their right, 38 British divisions held 67 miles of the front. 95 French divisions held the remaining Allied front line, stretching nearly 400 miles. Opposing these 139 Allied divisions were 117 German divisions. France, which had suffered nearly 2,500,000 casualties in 1915 alone, had nearly 5,000,000 men in arms, mostly in France, but was also strengthening its forces in Salonica, Greece. At the beginning of 1916, Great Britain had a million men in France, and another half million in Egypt, Salonica, and Mesopotamia. British forces had suffered half a million casualties — dead, wounded, prisoners of war, and missing. The New Army Britain had begun building in 1914 continued to grow, helped in part by the British Military Service Act which introduced conscription in January, 1916. Britain’s 38 divisions on the continent would grow to 57 by July, and its army extend its right, taking over more of the front from the French. With the loss at the Marne in 1914 that led to the dismissal of his predecessor as Chief of the German General Staff, General Erich von Falkenhayn, had determined that Germany would fight a defensive war on the Western Front, with the proviso that any ground lost to an enemy offensive must be recovered. He also believed that offensives on the eastern front would not bring victory: though Germany might drive deeply into Russia, it would do so to little effect as the Russian army could simply retreat. Falkenhayn believed his country’s primary enemy was Great Britain, and concluded that to defeat it, he must first defeat its ally and chief support, France. He aimed for decisive victory in 1916 by destroying the French army. He identified the salient at Verdun, a fortified city on the Meuse River, as the place to defeat France. With German forces to the north and east, Falkenhayn envisioned the Verdun salient as a funnel. By staging limited attacks against it, he hoped to draw French defenders and reinforcements into a narrow channel — his funnel — and destroy them with artillery from either side. 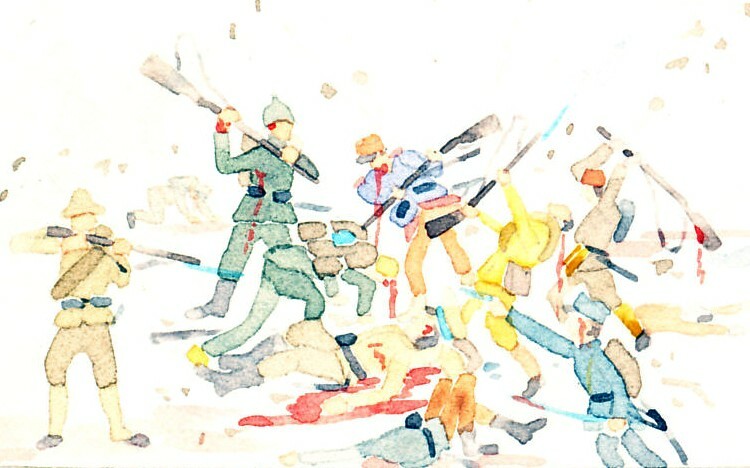 He hoped, at little cost to his own forces, to bleed France white. In the event, Germany, too, bled. As Joffre and Haig planned their offensive on the Somme, the German assault on Verdun began. On 21 February, 1916 von Falkenhayn began the siege of Verdun with a bombardment by 1,200 guns, followed by an infantry assault. French defenses crumbled over the next several days. Joffre, little valuing fortresses like those that had fallen so quickly to advancing German forces in 1914, was awakened to the symbolic and political importance of Verdun by French Prime Minister Briand, and put General Henri Philippe Pétain in charge of its defense. Pétain organized his troops, artillery, and transport well. He used his artillery to great effect, destroying the German and Austrian howitzers that had demolished the Belgian fortresses two years before, and blowing up a German magazine with 450,000 heavy shells. He ordered repeated counter-attacks to slow the German advance, and rotated his troops frequently. He was able to do so because he kept the one light rail line and one road to and from Verdun open to deliver supplies and reinforcements to Verdun. Each day as many as 3,800 trucks did so on a road kept open under bombardment by thousands of workers. By early March, Pétain had steadied Verdun's defense and supply. German forces continued the assault, capturing outer forts, but at increasing cost. Fort Douaumont fell on February 25, but Fort Vaux, the second of Verdun’s principal outer forts to fall, held until June 6. With its fall, the French prepared to evacuate Verdun. But the Austro-Hungarian army was crumbling before Russia’s Brusilov Offensive (begun June 4), and, in mid-June, Falkenhayn moved troops from the Western to the Eastern Front to steady his ally. The Anglo-French offensive on the Somme, begun July 1, demanded what troops Germany could spare, and soon ended significant German assaults on Verdun. Falkenhayn had failed, and, on August 29, Kaiser Wilhelm replaced him with Generals Paul von Hindenburg and Erich Ludendorff, commanders of German forces on the Russian Front. They formally ended the Verdun offensive on September 2. 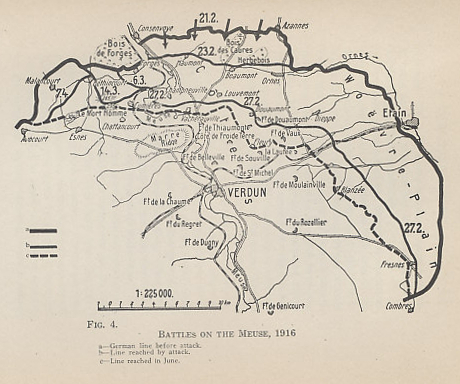 Before the end of the year, on October 24 and December 15, French forces under General Robert Nivelle retook Verdun's outer forts of Douaumont and Vaux with light casualties. The government replaced Joffre with Nivelle late in the year. His rise to prominence and command would lead to near disaster for the French in the spring of 1917. Falkenhayn’s goal of bleeding France white had done the same to his own army. His prediction of three French deaths for every German killed had been wrong, but French deaths and missing in action were double those of German forces. France lost over 315,000 men in the Battle of Verdun, Germany 281,000. Initially protecting an oil pipe line that ran from Ahwaz and oil fields in Persia to Basra, a commercial and communications center on the Persian Gulf, the British expanded their footprint, moving up the Tigris and Euphrates Rivers, then lured by Baghdad. The British had taken Kut-el'Amara in September, 1915, then lost the Battle of Ctesiphon further upriver, just short of Baghdad. They retreated back to Kut. Besieged by the Turks, the British and Indian army commanded by General Townshend trapped in Kut-el-'Amara in Mesopotamia could not break out, and attempts to relieve the siege failed. On April 29, 1916, Townshend surrendered with 9,000 men, 6,000 Indian and 3,000 British, the largest British army to surrender since the surrender to the Americans and French at Yorktown. The campaign had cost 40,000 Empire casualties. In August 1916, General Maude took command of British forces in Mesopotamia. Maude began working his way along the Tigris and Euphrates Rivers, beginning with the west bank of the Tigris. In 1916, the Russians continued advancing against the Turks in eastern Turkey, taking the fortress of Erzerum in a region with a large Christian population, much of it Armenian. 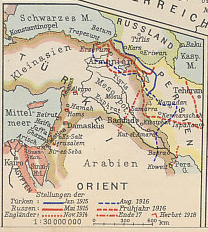 To the south of Erzerum, the Russians advanced into Persia in hopes of joining a British advance on Baghdad. To the north, Russian troops advanced along the coast of the Black Sea, taking the port of Trebizond. In January, 1916, General Archibald Murray was given command of British Commonwealth forces in Egypt. The Turkish victory in Gallipoli and the Allied evacuation released Turkish troops for redeployment to the Syria/Palestine Front front. German General Liman von Sanders, who had commanded Turkish forces at Gallipoli, was given command of Ottoman forces in the theater. There was much Arab opposition to the secularization of the Ottoman Empire promulgated by the Young Turks after their successful 1908 revolution, and Arab members of the restored Ottoman Parliament tended to support the countercoup of 1909. By mid-1916 this opposition had coalesced into an Arab Revolt in the Arabian Peninsula, particularly in the Hejaz, the west coast of the Peninsula along the Red Sea and site of the holy cities of Mecca and Medina. On June 5, the Arabs tried to take Medina. On June 10, they took Mecca besieging a small Turkish force. As the Arabs tried to seize other coastal cities including Jeddah and Yembo, British ships supported them by shelling Turkish forces, and launching seaplanes to bomb them. Through these ports, the British supplied arms to the Arabs, and landed troops of the Arab Regular Army, captured Ottoman soldiers who had volunteered to fight for the Arab Revolt. Murray dispatched a military mission that included T. E. Lawrence of the Cairo Intelligence staff to bring the Arab population into the war on the Allied side. As Lawrence of Arabia, he offered more than he would be able to deliver, as the French and English had no intention of turning Arabia, Syria, and Palestine over to the native population. On the Isonzo River, the Italians recommenced the Battles of the Isonzo River, launching the Fifth on March 9. Fighting continued until the 17th. 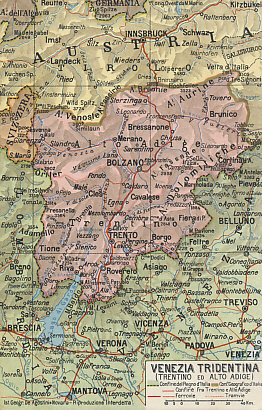 There would be four more Battles of the Isonzo before the year was over. Commanding the Austro-Hungarian forces, Conrad von Hötzendorf had tried to get German support for a plan to attack Italy in the Trentino, southern Tyrolia, and drive the defenders from the mountains to the northeast Italian plain and the Adriatic Sea, trapping most of Italy's forces, including those fighting on the Isonzo, between the mountains, the sea, and Austro-Hungarian armies. Preparing for the offensive at Verdun, the Germans were unwilling to provide troops. Conrad instead drew from his forces on the Russian and Isonzo Fronts. On 15 May, 1916, Austria-Hungary launched the Asiago Offensive, attacking Italy in the Trentino with two armies. In its initial assault, Austria-Hungary regained some to the territory it had lost the previous year, and took the city of Asiago, but could not break through to the northern Italian plain. Italian counter-attacks, including one by the newly formed Fifth Army, helped stop the Austrian offensive. On June 2, less the three weeks after the start of Conrad's offensive, the Russians launched the Brusilov Offensive, in part to answer Italy's plea for aid. As the Russians pushed the Austro-Hungarians back, in increasing disarray, in Poland, Galicia, and the Bukovina, Conrad redeployed his troops, and consolidated his position. An Austro-Hungarian retreat in late June left the front line little changed from that at the beginning of the offensive. Commanding Italian forces, General Luigi Cadorna saw an opportunity to strike. Austria-Hungary had limited railways to redeploy its forces, but the superior Italian internal lines of communications allowed Cadorna to shift some of his forces from the Trentino to the Isonzo Front. On August 6, he launched the Sixth Battle of the Isonzo, and by the 17th, his troops had crossed more of the River, and taken the city of Goriza, but they could not drive the Austro-Hungarians from the Bainsizza Plateau north of the city. The Sixth was the most successful of Cadorna's Isonzo offensives, and with its success, Italy finally declared war on Germany on August 28. Before the year was over, the Italians struck along the Isonzo three more times with little further gain: the Seventh Battle of the Isonzo, from September 14 to 17, the Eighth, from October 10 through 12, and the Ninth, from November 1 to 4. 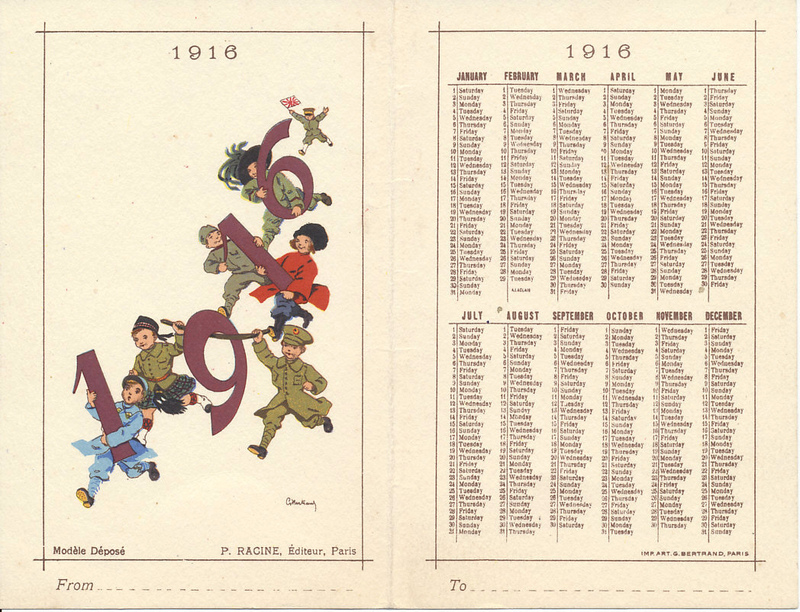 By the end of the 1916, Italy had lost another 500,000 men, double its losses in 1915. Germany's grand plan for 1916 was to drive France from the war by besieging Verdun, and to starve Britain by resuming unrestricted submarine warfare. When Germany did not go ahead with its submarine campaign, the Kaiser replaced the command of the Imperial Navy on March 15, accepting the resignation of Admiral of the Fleet Alfred von Tirpitz, replacing him with Admiral Henning von holtzendorff. The new commander began planning to strike Britain. Commanding the German High Seas Fleet, Admiral von Scheer developed a plan to draw the British fleet into battle by sending a small decoy fleet to entice the British, with the fleet then turning to draw the British to face the full force of the German fleet. The British knew of the plans, and had the German codes from the Russians, who had found them on the body of a German naval officer in the Baltic. The British developed a mirror plan to the German one. On May 30, the British Grand Fleet put to sea; the Germans did so the next day with their primary and decoy fleets. At about 3:30 in the afternoon, the smaller decoy fleets encountered each other west of the Jutland Peninsula and the Skaggerak. 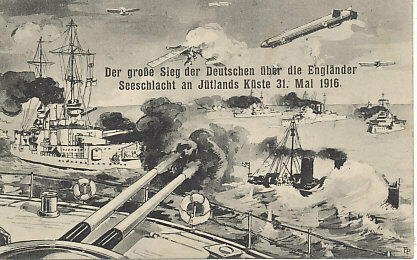 The Battle of Jutland, was the greatest naval encounter of the war. Celebrated by the Germans as a victory - as it was in terms of numbers of ships lost - it had little effect on the outcome of the war. Germany was too intent on saving its fleet for the postwar period to put it at risk in the war. On August 18 the German fleet again came out. The British raced to meet it, but ran into a submarine ambush. The British did not contest the German fleet in the southern North Sea after that. But von Scheer reported to the Kaiser that the German fleet could not break the British blockade. Germany did not have enough submarines to both support the fleet, and to conduct submarine warfare. The German fleet remained in harbor, and the Germans put more faith in submarines. At a conference at Pless in September 1916, Germany again decided on unrestricted submarine warfare, with no warning given, although some participants cautioned that this risked bringing America into the war. After its crumbling before the German-Austro-Hungarian Gorlice-Tarnow Offensive of 1915, Russia was better positioned in many ways, with a shorter front line, improved communications, and an army that was better equipped. Russian strategists disagreed over whether to attack Germany, the stronger and ultimate opponent, immediately, or the weaker, Austria-Hungary, in hopes of eliminating it before turning against Germany. But within the country, hunger and strikes were mounting, and the Tsar was using Cossacks and police against his people. In line with the Allied plans for joint offensives agreed in 1915, Russia planned a July offensive, but responded earlier in the year to requests for supporting offensives from its allies France and Italy. In an effort to relieve pressure on Verdun, the Russian launched a two-pronged offensive at Lake Narocz near Vilna on March 18, 1916, with one army attacking in the north, a second in the center towards Warsaw. In conditions utterly unsuitable to an offensive — alternate freezing and thawing of roads and fields — the Russians lost up to 110,000, the Germans, 20,000. Many Russians, and Russian commanders, concluded they could not defeat their strongest foe, Germany. When Italy requested an offensive against Austria-Hungary to relieve pressure on it from the Asiago Offensive, only General Alexei Brusilov was prepared to respond. On June 4, 1916, Brusilov, commenced an assault against Austria-Hungary. Rather than selecting a breakthrough point, Brusilov attacked along a 20-mile front with little or no preliminary bombardment. Taken by surprise, the Austrian-Hungarian forces collapsed, with the Russians taking 250,000 prisoners. Russia's successes continued into August. 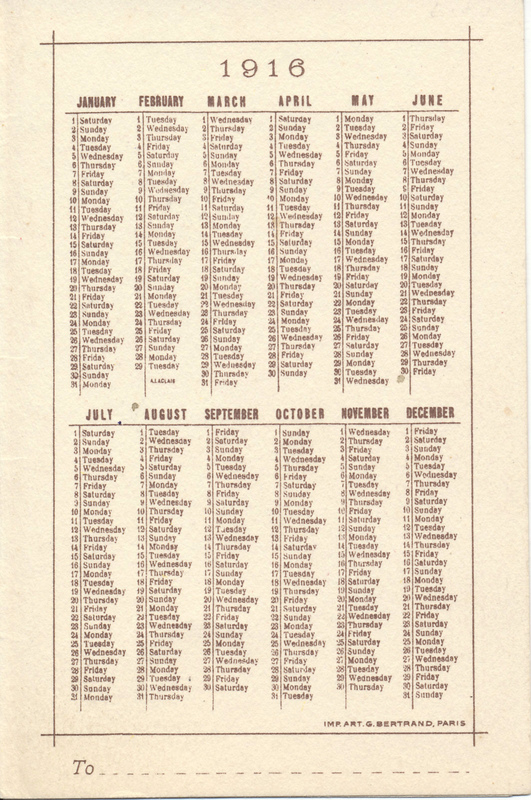 On July 27, the Austro-Hungarian First Army was crushed, the next day, the Fourth Army. But Germany again came to her ally’s aid, drawing forces from the Western Front and the Verdun offensive, and stopping the Russian advance. Despite the great success of Brusilov’s Offensive, the Russians suffered 1,000,000 casualties, many of them in fruitless frontal attacks. Austria-Hungary's official history recorded 464,382 men and 10,756 officers lost, but casualties have since been estimated to have been as high as 750,000, including 380,000 taken prisoner, many as deserters. German troops would be increasingly intermingled with those of its ally, and German commanders would soon take command of its ally's forces. The site of the Anglo-French offensive on the Somme agreed by Joffre and Haig at the end of 1915 had been selected in part because it was at the junction of the two armies. But France’s needs for forces at Verdun required it transfer more of its line to British forces. As Britain extended its line, the junction of the Allied armies was no longer on the Somme River, and the sector for the Allies great 1916 offensive was primarily held by British and Commonwealth forces. Allied generals had concluded that assaults had to be preceded by ever longer bombardments, and that ever more men must go into battle, particularly in a first massive wave. In mid-1916, the New British Army, trained to climb out of their trenches – to go over the top – and advance in line, bayonet ready, were deployed in France in force. Defending Germans would greet them with machine gun fire. On June 24, preparing for a July 1 offensive, Allied artillery begin five days of heavy bombardment, throwing 12,000 tons of shells, providing the defenders with ample warning of the impending assault. On July 1, over 100,000 men of the British Expeditionary Force went over the top, attacking on a 14-mile front with 11 divisions and 5 in support, supported by 1,500 guns (but not heavy artillery), seeking a breakthrough. To their south, nearly 50,000 French forces begin their assault along a front of eight miles. The day was deadly. The British suffered 60,000 casualties on the first day of battle, 19,240 of them dead, the greatest single-day loss in the history of the British army. Forces of the British Commonwealth suffered heavily. The Newfoundland Battalion lost 91% of its men in 40 minutes. That same day, French forces — which were better prepared and more experienced, and deployed heavier and more accurate artillery — achieved and in some cases surpassed their objectives. They would be delayed by the slower British advance in the coming weeks. The offensive kept up, with renewed assaults on July 14, July 25, September 3, September 15, September 20, and September 25. The British first used tanks on the 15th, but in too small numbers to have much effect. A final British attack on 13 November, ended the Battle of the Somme. 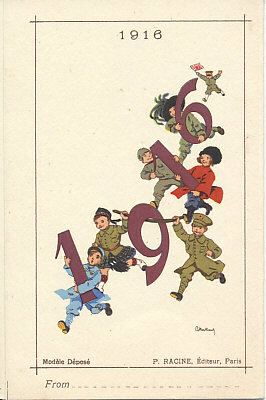 In the course of the campaign, the British lost 420,000 men, the French 194,000. The defending Germans lost 440,000 men, many of them in counter-attacks to retake lost ground as Falkenhayn had demanded. Kitchener’s Army, the British soldiers who had joined in 1914, was destroyed at the Somme. British attitudes toward the war changed as soldiers and civilians saw the lives of brave men away thrown away by blundering, obstinate generals. Although deeply dug in, the German forces had been unprepared at the Somme. They had faced superior forces in men and artillery, and the had Allies maintained air superiority through the battles, shooting down observer balloons and strafing trenches. Large numbers of non-commissioned and front-line officers were lost, some of them to the first instances of fragging, killed by their own men. German OHL had not expected, and was unprepared for, the losses their forces had suffered. As the Brusilov Offensive was pushing back the Austro-Hungarian armies on the eastern front, Romania saw an opportunity to join the Allies. On August 27, 1916, Romania entered the war on the side of the Allies, advancing into Austria-Hungary in Transylvania with its large ethnically Romanian population. Dismissed as Chief of the German General Staff after his failure at Verdun, Falkenhayn was given command of the Central Power forces that drove Romania out of Transylvania, and occupied much of Romania before the year was out. After the failed attempt to aid Serbia in 1915, the British had been prepared to evacuate it troops from Greece, but had kept them in place at the request of the Tsar. Many of the British, Australian, New Zealand, and Indian troops who evacuated Gallipoli were redeployed to Salonika and Egypt. 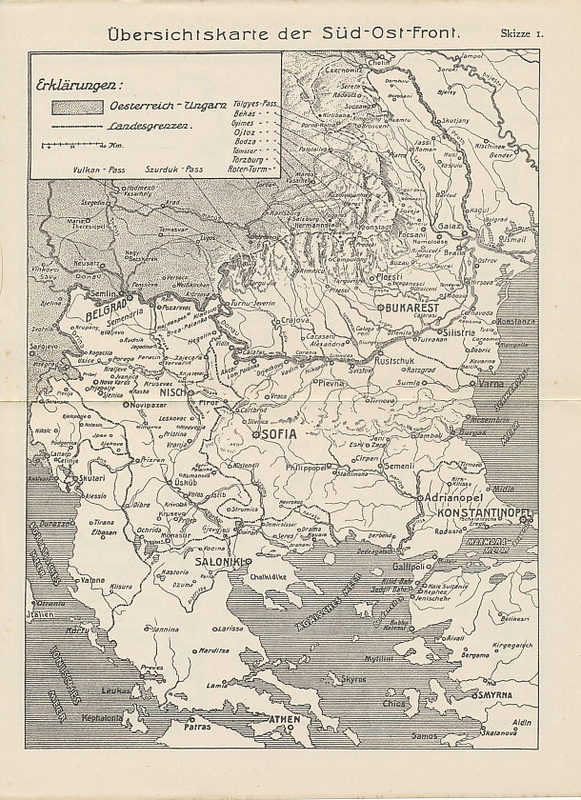 In the spring of 1916, many of the Serbian soldiers who had survived the retreat across Albania joined the Allies on the Salonika front, a line that included British, French, Serbian, Russian, and Italian units, and a Montenegrin battalion under French command. In overall command of the Allied forces, French General Maurice Sarrail prepared an offensive against the Bulgarian forces to his north to prevent them from joining an offensive against Romania. But the Central Powers were well aware of Sarrail's preparations, and the Bulgarians struck first, on August 17, against the Serbian line, advancing until August 26, when the Serbs held. Sarrail finally mounted his offensive, the Battle of Monastir, in September. The Fokker E-1, designed by the Dutch national Anton Fokker, and introduced in April 1915 with a machine gun capable of firing through the propeller, gave its pilot much greater accuracy than planes that fired over the upper wing. In the spring of 1916, the Allies began to counter the advantage the E-1 had given German airmen with the introduction of the French Nieuports and British F.E.2 pusher planes that positioned the propeller behind the pilot. By the end of 1916, the Germans countered by introducing the Albatros, a plane with a plywood rather than a canvas fuselage. The factory of Britisher Thomas Sopwith produced aircraft for the Royal Navy and Royal Flying Corps including the Sopwith Snipe, Pup, and Triplane, a high-performance plane and model for the better-known Fokker Dr.I. 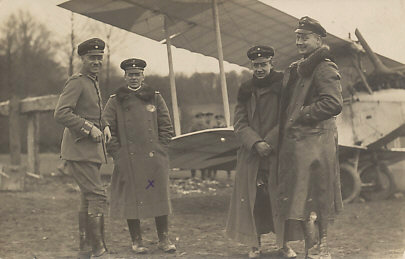 Max Immelman, the Eagle of Lille and first celebrity ace and Knight of the Air, flew the E-1, and was killed in combat on June 18 with 15 victories. He was the first ace to win the Pour le Mérite — the Blue Max. Oswald Bölcke, was the first great air tactician, and founder of the Jadgstaffel — the hunter squadron — was killed in a collision on October 28. He developed the Bölcke Dicta, the rules of engagement for his airmen. At his death he had 40 victories, and was the second ace to win the Pour le Mérite. Bespectacled Kurt Wintgens was killed in action, on September 25 with 19 victories. In May, 1916, Georges Guynemer, one of the greatest of French aces was flying and fighting over the battlefield of Verdun. In June, he was over the Somme. By the beginning of October French aviator Charles Nungesser, had brought down 15 enemy planes and three observation balloons. He would survive the war as the third of France's great aces. On April 20, the French American Escadrille was formed, with American airmen, most already volunteers for France, under the command of French officers, including Nungesser. The unit was later renamed, and is better known as, the Lafayette Escadrille. In 1916, Germany continued to use Zeppelins and the Schütte-Lanz airship against enemy forces and as a terror weapon on civilian targets. Paris was, for example, bombed on January 28, with the loss of 26. The attack called forth cries for the French to turn the same table on German cities. London was bombed, as it had been in 1915, but its defenses — and British aircraft — had improved. On the night of April 30—May 1, Zeppelin LZ.15, while on a mission with six others to the British capital, was picked up by searchlights, hit by two anti-aircraft shells, and attacked by a British B.E.2c that struck with explosive darts, incendiary bombs, and machine gun. Generals Paul Hindenburg, appointed German Chief of the General Staff on August 28, and his Quartermaster General Erich Ludendorff, newly commanding the German Army, began reorganizing the economies of Germany and its primary ally for war. Having repeatedly come to Austria-Hungary’s aid, they subordinated its army to the German. The commanders had concluded that no decisive victory would be possible in the field in the coming year, so Ludendorff began preparing a new defensive line. Unlike Falkenhayn, he was willing to give up occupied ground, and designed a line, a defensive line, to Germany’s advantage with dugouts and light rail. Victory, he concluded, would be won by starving Britain through unrestricted submarine warfare. On November 21, Austro-Hungarian Emperor Franz Joseph died, ending a reign that had begun after the revolutions of 1848. His great nephew Karl, nephew of the late Franz Ferdinand, was crowned Emperor of Austria and Apostolic King of Hungary. Allied commanders met in November 1916 and agreed to simultaneous offensives on the Western, Eastern, Italian, Salonika, and Palestine Fronts in the coming year. These plans would change. In December, David Lloyd George became Prime Minister of Great Britain, and the French Chamber of Deputies forced Joffre into retirement, replacing him with Robert Nivelle.